Welcome to a magical place that invites you to discover all things imaginative and inspiring, breath-taking, unbelievable and unforgettable. A mythical ocean paradise, that once was lost and now is found. ATLANTIS is a unique ocean themed resort destination and waterpark on PARADISE ISLAND in the BAHAMAS. 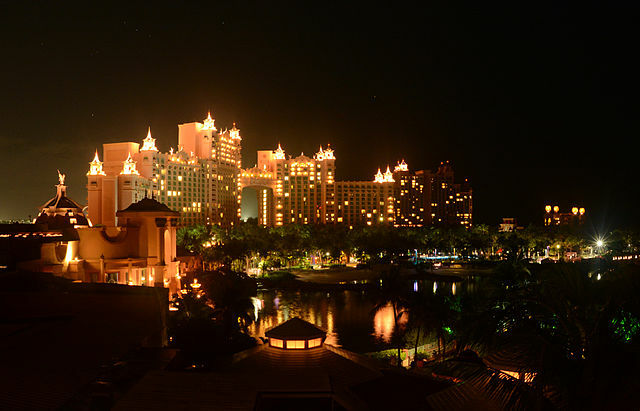 Paradise Island centrepiece is the mammoth Atlantis Paradise Island Resort and Casinos. It offers variety of accommodation choices along with a pulsing nightlife and sightseeing in its own right. From the moment you arrive you’ll be immersed in a dazzling array of enchantments, luxuries and pleasures. From one of the Caribbean’s largest casinos to one of a kind kid’s adventures, world class restaurants choices to impressive shopping beaches and pools to the ultimate Water experience. You can choose whatever accommodation you require like the Royal Tower, Coral Towers, Beach Towers and Atlantis Beach Towers. There is no shortage of things to do at the Atlantis. AQUAVENTURE, NON-STOP WATER, NON STOP FUN; WATER PARK is one–of–a kind 141 acre waterscape. They have water slides, river tides, pools beaches and private cabanas. Aqua venture is connected by a lush tropical environment that is both immersive and interconnected and perfect for all vacationers, whether young and old. The water park offers an extreme excitement and fun. ADVENTURE like scuba, snorkel, shark adventures, stingray experience and sea squirts keeps you entertained. The BEACHES here have white sand and crystal blue water. There are three beaches where the guest settles down to relax on cove beach, paradise lagoon or Atlantis Beach. There are more than 20 swimming areas and 11 refreshing and distinctly different pools including three pools designed for families and children. ACTIVITIES like fitness center, tennis, shopping, Earth and fire pottery studio, Atlantis Theatre, Atlantis library, yatch and fishing charters and tours keeps you engaged during your stay. Atlantis live concert series brings in top performers constantly entertaining the guest with performances which is unforgettable. When the sun sinks down, Atlantis turns up the heat. So enjoy your night life at the Cove Pool, Aura Nightclub, joker’s wild comedy club and Bars and lounges for laughter and dances. Dining and entertainment options are endless in 38 restaurants and lounges. You can enjoy treatment at the world class MANDARA SPA. Prepare yourself for the most incredible vacation destination in the world. Whatever vacation experience you desire you will find it at Atlantis Paradise Island.